Our DIY Kits come with a specially designed Solar Air Vent that has a patented AutoCloseTM feature. Unlike other air vents, the solar air vent only operates during normal conditions. When a solar system goes into stagnation (and it will!) the air vent automatically closes at 180 F to ensure that the steam does not escape from the system and instead the expanded volume is forced into the expansion tank. One the system returns to normal the automatic air vent opens and continues to remove micro bubbles up to 99.7%. It is important to install the air vent on the supply of the highest collector on your loop. Use pipe thread sealant when connecting this and sure the air vent faces up. An Aurora Solar Flex SS MPT fitting (EF ¾” MPT) will connect to the air vent and be the start of your supply piping loop. Place the air vent on the cold supply side of the collector. An air vent valve is should always be installed on the highest point of a solar system. The valve will serve two purposes; the 1st is to remove any air in the system. The 2nd importance is to act as an air breaker valve and allow the system to drain. Without this it is very hard to drain the system as you need to break the vacuum inside the piping by allowing air in. When choosing an air bleed valve, be sure to use a special one designed for solar. A regular air vent from a local plumbing store has plastic and will be destroyed the 1st time the system stagnates. An AutoClose Solar Air Vent will ensure that there is no need to return to the job to vent air after the system is commissioned. 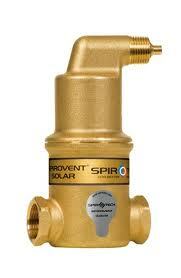 Spirotech offers an extensive range of automatic solar air vents and deaerators for solar water heaters. These products are specially designed and developed further for use at higher pressures and temperatures. Just like the rest of our product range, the solar applications of Spirotech are 100% leak-free. They are a reliable and low-maintenance factor in your installation. In terms of solar applications, too, our products have a dual effect. SpiroTop automatic solar air vents and SpiroVent deaerators improve the efficiency of your installation and save time and money during their installation, commissioning and maintenance. Extremely high temperatures can occur in solar systems, which leads to the formation of steam. Valves are installed to prevent vapour release and overheating. Without valves, solar heaing systems can even boil dry. Thanks to a patented invention, Spirotech can offer a solar air vent product range with the so-called AutoClose function. These valves only close if it is really necessary.